A few weeks ago we were sent some Crest and Oral-B Pro-Health FOR ME and Oral-B Stages products to try out. My sons were surprisingly excited about the Pro-Health FOR ME products. I really didn't think it would make that much of a difference for them but it totally did. 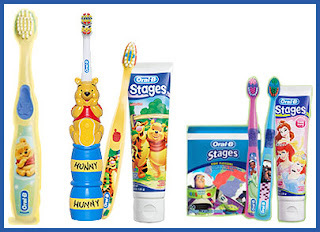 They have been happily brushing, rinsing and flossing more than ever before! Honestly - we used to have to force them to brush their teeth twice a day, never mind using any sort of floss or mouth wash.... but since the Pro-Health FOR ME products have arrived there has not been one single fight over oral care. Not one. And if I forget to offer they ASK to use the mouth wash (neither of them can actually open the kid-safe lid on their own yet) and floss without prompting. I have definitely been impressed. Olivia passionately hates toothpaste... I mean she really hates toothpaste. Using toothpaste has always prompted tears and anger. So much so that I resorted to brushing her teeth with plain water half the time just to avoid the screaming. I was sceptical about whether or not the Oral-B Stages products would make any difference but Olivia will actually allow me to use the Oral-B Stages toothpaste! She doesn't love it but she doesn't throw herself on the floor in abject misery either. Definitely an improvement. The Winnie-the-Pooh toothbrush is the perfect size for her tiny hands and mouth as well. We were in the store the other day and she saw the Princess style Oral-B Stages for 5-7 year olds and begged me to get it for her. Princesses are always a hit with my daughter. We have been very impressed with both the Crest Pro-Health FOR ME and Oral-B Stages products and fully intend to continue using them!